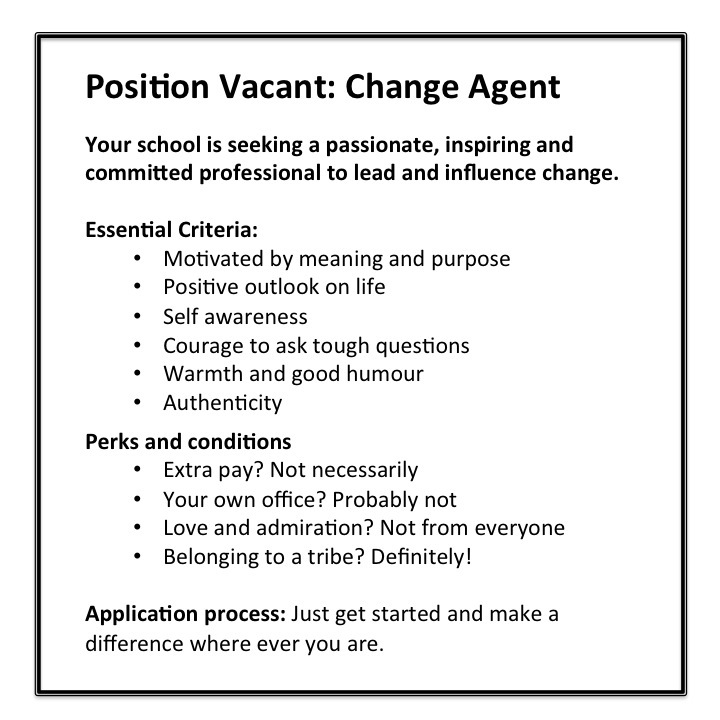 Position vacant – Change Agent: 6 characteristics required to lead change wherever you are. This is an exciting time to be in education. There is a groundswell for change, that will eventually see governments and administrators stop and take notice. The innovation in school education that so many of us seek seems to be low on their policy agenda at the moment. So as a result leaders are emerging, individuals, groups and entire schools, are taking action and creating a movement. The time for incremental, slow-moving change has passed, and now we need to step it up a pace. Leaders are restless people. They see and sense the need for change, but usually the biggest blocker is the culture that surrounds them. It can be conducive to change, or resistant. 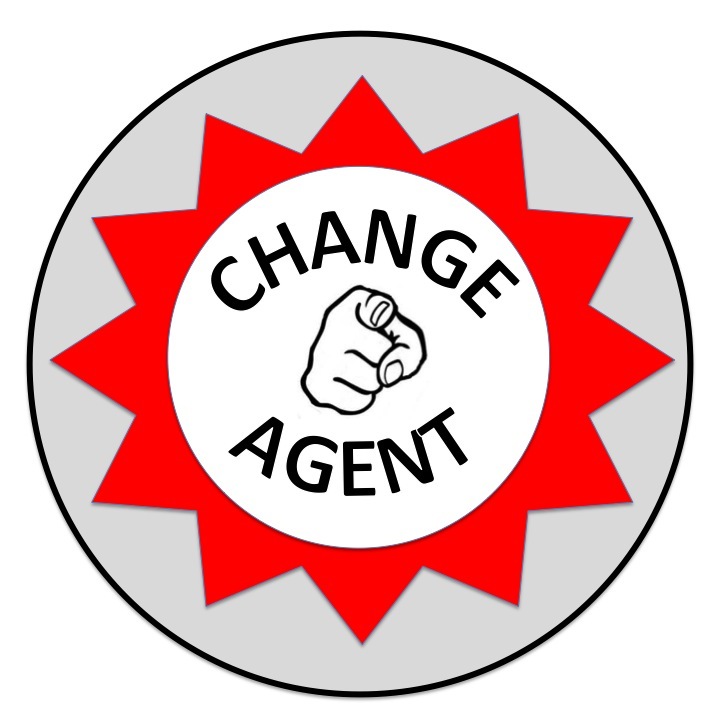 To change culture effectively we need to strategically position change agents in schools. Leaders are at all levels in an organisation. People are looking for leaders. People will be poorly led, if that’s the only option available. Change is inspired by vision. Change is effective when it disrupts the prevailing culture. Change is a subject, an attitude or an environment that can polarise people. There are those who love it and those who are terrified by it and many in between who sit on a bell curve from acceptance to rejection. Motivated by meaning and purpose: Being an effective change agent starts internally. You will not be successful if this is just your next step on the ladder of success. You want to do this because you know that change is essential to for growth, improvement and potential. Positive outlook on life: You possess a can-do attitude that excites people and compels them to join you on the mission. You are known for being a glass-half-full kind of person. Self awareness: Change agents are optimistic, but also have a good grasp on their own strengths and limitations. You need to build a team with complementary skills and talents. People with honest self-awareness attract great talent. Courage to ask tough questions: This is not mutually exclusive with having a positive outlook. As a change agent you will not be a person who accepts the status quo. You will need to find alignment between roles and goals and develop a plan. This will mean shaking things up. Warmth and good humour: Shaking things up and being courageous needs to be conveyed in such a way that relationships are not only maintained, but strengthened. Not everyone will accept your ideas, but that is a choice that they have made, so long as you have prioritised relationships along the way. Change agents can’t assume there will be any. You do it because you believe that students need an education that will better equip them for their future. You will, however, belong to a tribe of world-wide change agents. There is no application process. Just get started and make a difference. Ref: Dr Samual Chand – Ch 5: Change starts with me. Thanks Anne. This blog really breaks down what is needed for change. Sometimes, It may be beneficial to have a third party on-board as coach, mentor, guide, collaborator and counselor – to help develop a strategy to deliver your vision, to police, to unblock roadblocks, to steer innovators. As well, someone with a ‘fresh’ perspective who can see what is happening elsewhere within other schools, corporations and society.